There is always that time of year – assessment report time – when parents are concerned that their child is writing in all capital letters, expecting that their child should be writing in the conventional case. We all know about the role that environmental print plays in our lives. 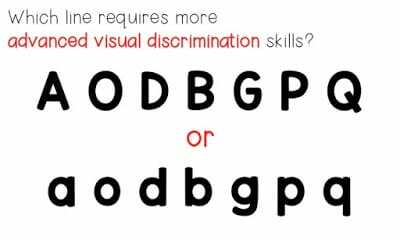 Young toddlers who cannot identify any letters can likely “read” the word Stop because of the power of environmental print. They might have names on their bedroom walls, and wooden toys in their playrooms – capital letters are everywhere. Capital Letters are EASIER to recognize. EASIER to write. 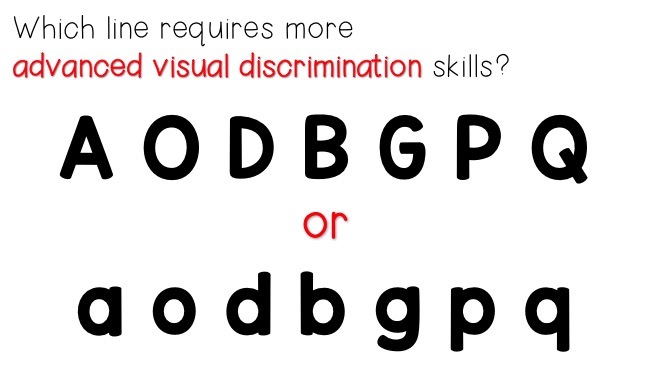 Children are still developing visual discrimination skills (the ability to discern one object from another similar object), and many lowercase letters look similar. Imagine being at the beginning of your learning journey and trying to decide which letter is an o, and which is a d? It can be pretty tough for the littles. Children are also developing their fine motor skills; capital letters have simpler lines than lower case and are easier for the children to master. The upper case letter E has four straight lines, whereas the lower case letter e requires a more complex movement and stronger hand muscles to write. Learning to write is a developmental process. Infants don’t learn to walk before they can pull themselves up to standing, and similarly, using capital letters is part of their developmental journey. Lev Vygotsky’s Zone of Proximal Development theory states that we always work toward what the students can do with a little bit of instructional support. It’s the place between work that has been mastered and work that is currently out of reach because it is too difficult. Once the children have mastered their names in uppercase letters, we can begin to support their learning of conventional name writing. We model conventional names in lots of places in our classrooms. Their attendance name cards are written conventionally, as are their center chart name cards, writing card examples, graphing cards, and snack mats. Every time a teacher writes their name, it is done conventionally. We support their fine motor skill development in the classroom to better prepare the children for drawing the more complex shapes that lower case letters require because as any preschooler will tell you: writing is tough work! With a few exceptions, most students will leave Preschool writing their names conventionally. They do it because we have supported their development as they learn to recognize letters, draw the lines, and finally – connect the dots and write their names at age 3 and 4.